Today’s Tiny House in a Landscape is from Fred Beal in Helena, Montana. My wife and I spent our first two years of our marriage in Helena and it is one of my favorite places. 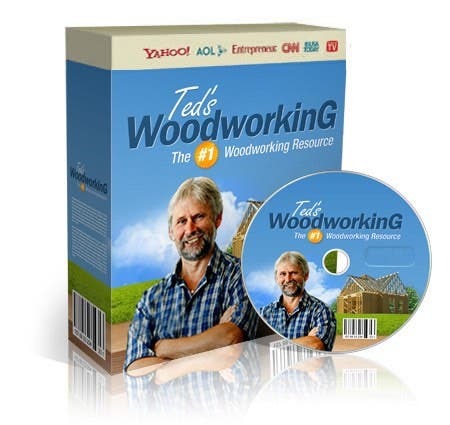 Fred is an expert with the Log Dovetail technique in building log cabins. 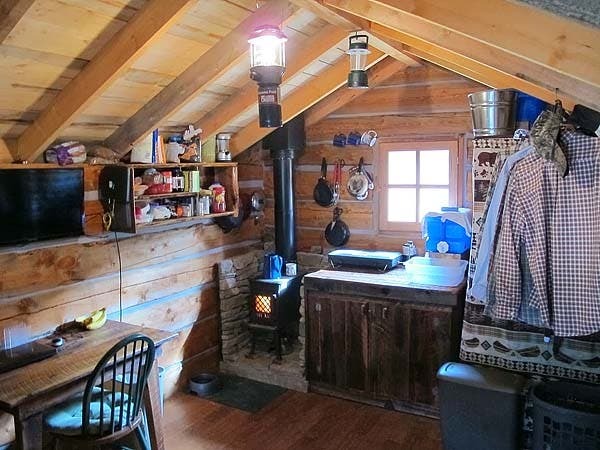 He has built this little 11 foot by 15 foot log cabin and is currently living in it full time. Following are some photos of his cabin and a short video of the building process. Enjoy! 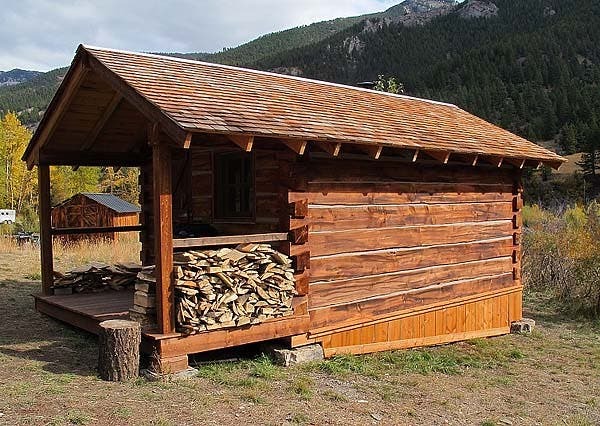 What makes a great log cabin kit? 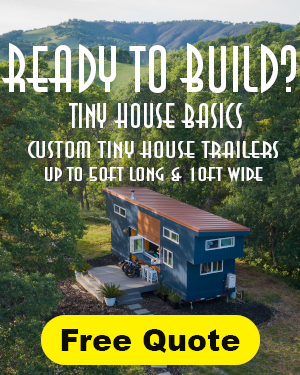 What Makes the Perfect Tiny Log Cabin Plan? Lovely! It would be helpful for your featured cabins to share what they use for water & sewer. Ellie, water and sewer. 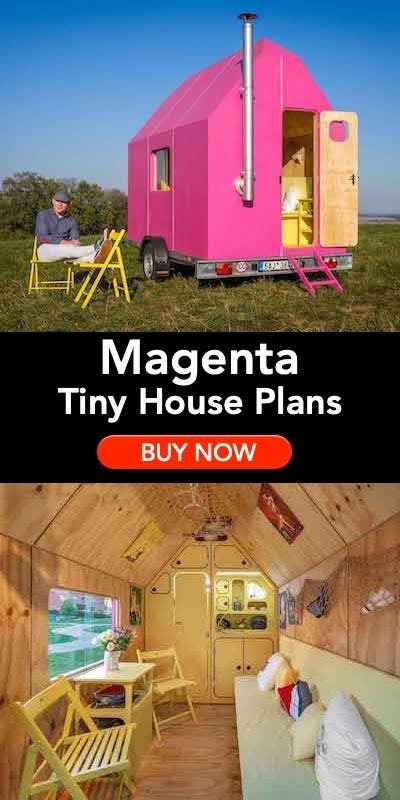 My guess because this is a tiny cabin, if you look at the pictures you will see a water container on the counter and a Tupperware tub as their sink. And as for sewer they probably have an outhouse. you can see in the photo his water set up. Simply a square water container with a tap sitting over a plastic wash bowl. When the container is empty you walk to your water supply ( tank, river etc) and refill it. Simple. And a very effective way to conserve water. I have lived without plumbed water for nearly 10 years and you really notice how much waste there is with plumbed water when visiting friends. This setup does for dishes, laundry and self washing. There is no need to waste gallons of water just to have a shower when a bowl and washcloth will do. And as for the toilet – look at the ideal spot this house is – you dig a hole for your waste and bury it. 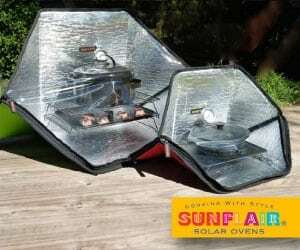 Go expel your waste the way nature intended – outside. I cant see that he would have a problem with anyone seeing him in that location. And when its raining – take an umbrella with you. Exactly how I live. I wish more people would choose this way for the sake of our planets water supply. I live alone now but I raised a family in this sort of setup and I loved it as the family worked as a team for the functioning of the home. We had no power either so no TVs, microwaves etc. A wonderful way to live and be in tune with nature. Give it a go. Two thirds of the world’s population lives without running water or toilets. This is an ideal location for simple basic living. 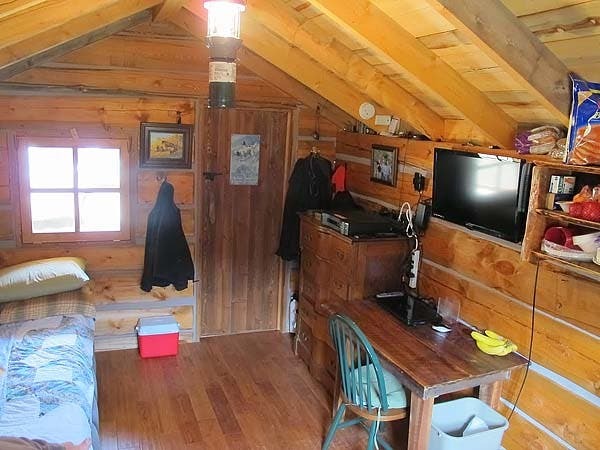 I lived in a similar 11′ x 20′ cabin for years. I spent many happy years in the Yukon in various shacks, shanties, cabins, tents and trailers with bucket and chuck it plumbing, AKA running water you run for. In winter there was always a pot of snow melting on the wood stove. 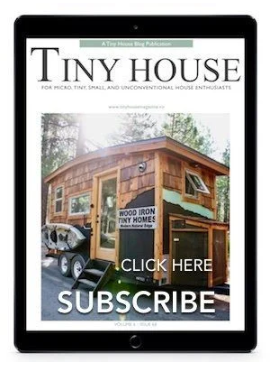 Outhouses and honey buckets work but a sawdust composting toilet is state of the art deluxe. I still part time this way but family obligations require lengthy stays in an urban setting. Thanks for the compliment. We have a nicely built outhouse and for water, we haul tap water water for dishes and use about a gallon a day for that. We do have an indoor shower. For that we use creek water, disinfected with a few drops of clorox the night before and then heated on the woodstove or on the gas burner. Nice no frills cabin Looks very cozy and I enjoyed the building sequence.Thanks for sharing and Enjoy. 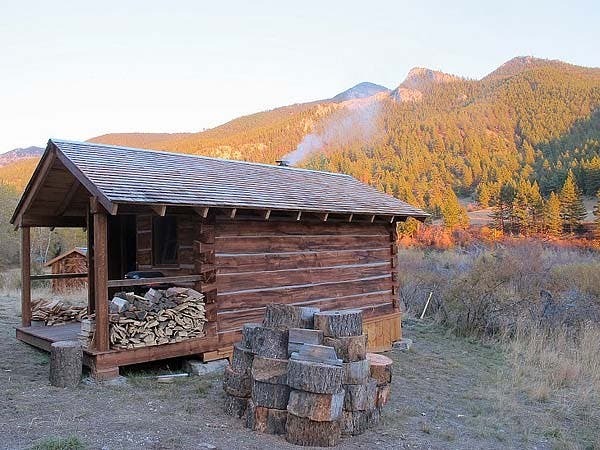 Great looking cabin, the scenery that it is surrounded by is amazing. 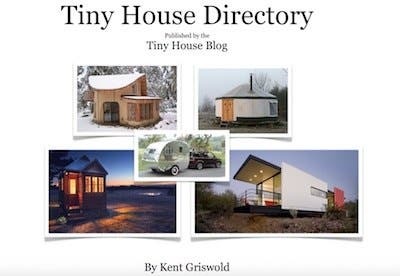 I love looking at these tiny houses. I live in a suburban community with a husband and 3 cats. Don’t know anyone willing to allow me to use his land in order to build a house; would need to buy land, and the cost seems prohibitive! What a wonderful space! I live in roughly the same amount of space but the artless simplicity of his is motivating me to get rid of more that I’m hanging on to – for why? Great video! Reminds me of Walden’s cabin. A place where deep thought can happen (if you leave the telly off, I suppose…). It might take away from the atmosphere, but some sort of roof insulation would probably be a good idea. Seems to have electricity. I see a TV and stereo. Nice work and a beautiful spot! 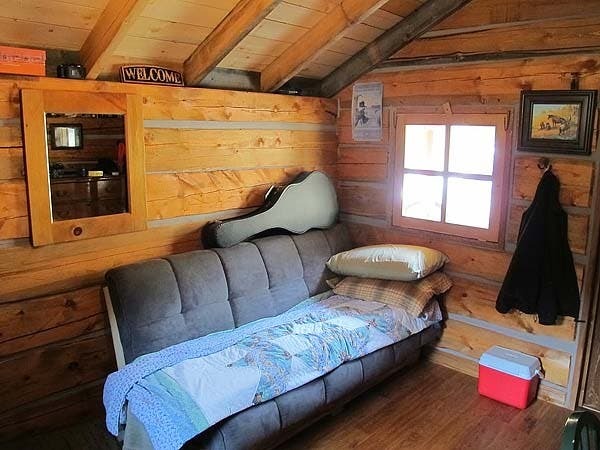 Not sure of the location, but I assume this is a “weekender” cabin since the roof has no insulation? Also surprised the shingles went on a low-slope roof with no ice shield or even tarpaper underneath. If there is snow here then even minimal winter use will melt the snow from the inside and create ice dams on the eaves which will then back water up under and inside. Finally, the woodstove is nicely slotted in, and a better installation than many I have seen (the stone heat-shield seems properly air-gapped from the walls behind) but the stove pipe itself is still too close (for most codes) to combustible material. Best advice a fire chief gave me was “Imagine every part of your woodstove glowing red-hot, because that’s what they look like when we get the call”. It is a full time residence now. Since the blog was posted, I insulated the roof with 4 inch thick blue rigid insulation. Pieces were cut to fit with a gap all around the edge, then spray foam filled that gap. Using an ice shield would have been a good idea but it seems like the insulation is preventing melting of the snow on top. I have it 85 degrees in here and the snow doesn’t melt. The stove pipe clearances are more than required by code as this is class A pipe.